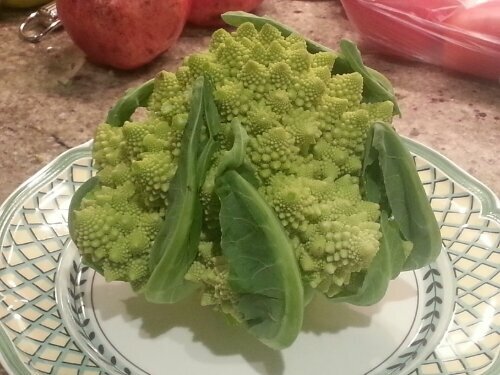 When I saw this beautiful broccolo Romanesco at the market, I knew I would use it to make this traditional soup from Rome. The result was delicious, and perfect for the cold weather we are having in New York. Cover the skate with cold water, and boil for half an hour to make a clear and flavorful fish broth. 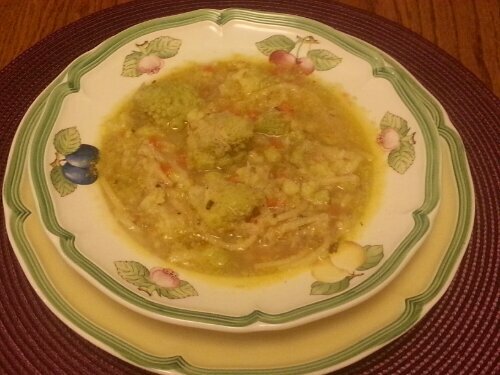 Finely chop the onion, the celery, the carrot, the garlic, and the parsley (stem included) to make a soffritto. Put the prepared vegetables in a casserole, add some extra virgin olive oil, and cook for a few minutes. Chop the anchovy in small pieces and add it to the soffritto. Then peal and chop the tomato, and add it to the soffritto, to give some color to the soup. 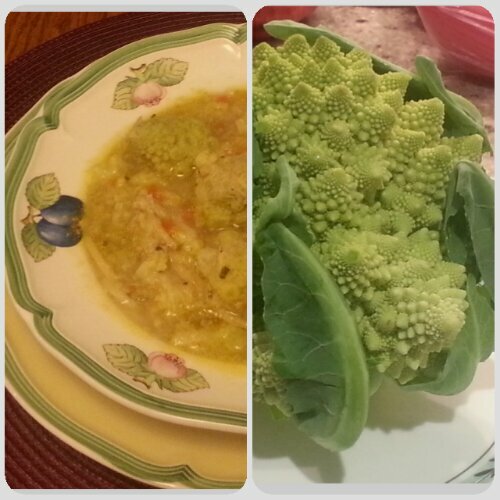 Separate the broccolo into small heads, add it to the casserole and let the flavors blend. Add salt and start adding the skate broth one ladle at a time. Let cook about 15 minutes, continuing to add the broth, to make a dense soup. Adjust salt and pepper, as needed. Add half of the fish meat. Break the spaghetti in three parts and cook them in the soup, they will need ten minutes.